Good question. We hear this a lot in consultations at Marketing 360®. 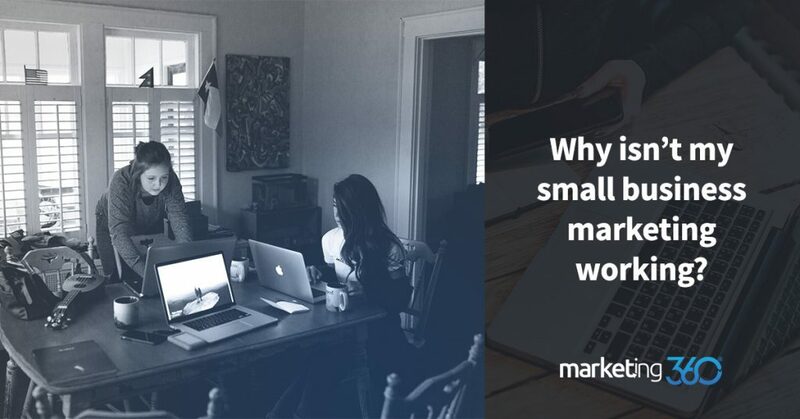 Let’s explore some of the main, underlying reasons that small business digital marketing efforts are falling short. Some problems are easy to identify. If your tooth aches, you know you need to get to the dentist. If the paint is peeling off your house, you hire a painter. If your car won’t start, there is probably a specific problem that needs to be corrected. When it’s fixed, the problem goes away. However, business marketing doesn’t work like any of these things. It’s often difficult to diagnose what the actual problem is. In fact, many businesses come to us unaware of the issues that beset their marketing campaigns. This is, of course, because a marketing plan is far more complex than house paint. A toothache is overt, but marketing problems tend to be subtle and hidden. There are marketing problems that are easier to identify. If you don’t have a value proposition, that’s usually apparent, as is not having a targeted audience. There may be competition that’s clearly edging you out. But let’s assume you’ve addressed these issues and you’re still struggling. What are the subtle, hidden problems that are bringing you down? Consider the following issues as they pertain to your business. If you answer in detail, you’ll shed light on problems that are hurting your marketing efforts. #1. You’re not engaging with the people who would benefit from your offer. You’ve overcome two big problems. You identified your target audience that will benefit from your offer and you seem to be reaching them, but they’re not engaging with your content. Does your content actually address their needs, or does it lean towards explaining the features of your service? Are you on the same platforms your target audiences are on? Does your content fit the tone of each platform? Is your content interesting enough to catch people’s attention? Do you have informational content that helps people as they go through their research process? Are poor design and overall low aesthetics detracting from the user experience? Are there technical issues that make your content slow to load or hard to find? Is your website up to date? Is the navigation simple and intuitive? Do you use a variety of media, including text, images, and video? Is your writing concise and easy to read? Does your competition offer superior, more engaging content? Do you use automation to personalize content as people move through the buying journey? There are few things more aggravating in marketing than seeing the ideal lead right in front of you, but not being able to win their attention and engage their interest. You know they’d benefit from your offer if they’d simply pay attention to you. Attention is in high demand online. You need to create exceptional content and take on a multi-channel approach just to get the people you must communicate with to take notice. #2. You’re not persuading people to see things from your point of view. So, you’re getting website traffic and social media followers, but you’re not generating leads nor are you getting sales. Your problem here may be one of belief. You know your solution is excellent, but the people who interact with your content are not convinced. Are there information gaps you’re not filling? Do leads really understand the value of your solution? Do people understand how your solution benefits them personally? Do you have a story or theme that helps people see how your offer fits into their lifestyle? Do you have problems with your cost/gain ratio? Do people see your offer as “worth it”? Does your product or service resonate with your audience? Are you recognizing and overcoming common objections? Do you have tactics to deal with hesitation? Do you have tactics that help you stay with leads and repeat your message? Are you direct enough? Do you tell people what actions to take and ask for their business? Do people trust you? Is there content like poor online reviews or sub-par designs that cause people to doubt that you’ll keep your promises? The ways you’ll persuade people are ingrained into your marketing efforts. Even when you’re informing or entertaining, your goal is to create an affinity with your brand. Also remember that you’re not just trying to get one “yes”. You must plan to get a series of yes answers from prospects that lead to the yes that earns you money. Your persuasive message must resonate with those you’re trying to influence. #3. You need to initiate a cultural shift but it’s not happening. In an effort to carve out a niche and gain a competitive edge, many startups create a product that requires people to make a change from the status quo and accept a new type of solution. If your business is relying on that happening – but it’s not – your marketing will be ineffective. Is the timing of your product launch right? Are you in a moment where the environment is ready for the shift you’re initiating? Is the leap you’re asking people to make one they’re willing to take, or is the move too much too fast? Are you in sync with current trends or are you moving against the grain? Are there influencers and advocates you can leverage to help you shift and gain momentum? Do you have a sense of how you’ll move through the product adoption cycle and gain majority adoption? If you’re going for a new innovation, carefully consider how you’ll gain your audience and get new people to accept your product. This should be part of your marketing plan from the beginning. People don’t like change and won’t readily accept it. Understand the time frames you’ll need to work within to make the shift happen, and have an aggressive content plan ready to get your message out. #4. You’re winning the race to the bottom. Cutting corners, disrespecting customers, and trying to be the cheapest commodity on the market creates a myriad of problems for your marketing. If you go the fast route to make short-term gains, you’ll sacrifice customer service and degrade employee morale. You might beat the competition in a sprint, but if you’re hoping to run a marathon you’ll be in trouble. Are you winning the race to the bottom? Are you going the cheap and fast route in order to make a buck? Are you business-centric instead of customer-centric? Is your reputation taking hits because you put your needs first? Do you support your community and have a social purpose that you can leverage as PR? For SMBs, trying to win the price battle is precarious. If your goal is to build your value proposition around low-pricing, that must be part of your marketing plan from the beginning. If you’re cutting prices (by cutting corners) to keep up with your competition, you’re winning a race in the wrong direction. #5. Your expectations and resources are not aligned. It’s not uncommon for us to do a marketing consultation with a person looking to start a business who wants to compete with Amazon, rank on page one of Google for all their search terms within three months, and has $700 a month to spend on marketing. You have to make sure your resources and expectations are aligned. You also have to create a budget that gives you a chance to compete and sustain yourself as your marketing gains momentum. Do you have a marketing plan and budgetary resources that will allow you to operate without a profit as you build your business? Do you understand how online search works, with a basic grasp of organic and paid search channels? Have you analyzed your competition and developed a plan that makes you competitive? Do you have a structured marketing plan with goals and benchmarks? Do you have an outline of your digital marketing KPIs? Is your marketing being executed by someone with the skills and time to make it successful? If there is one thing we see with businesses that are successful at digital marketing, it’s that they identify and – as often as possible – deal with issues proactively. The key is planning. Know your audience and how they’ll respond to your value proposition. Understand their buying journey and how you’ll interact at every step. Outline sets of attainable goals. It’s more efficient to deal with potential problems than active ones. In that way, marketing is the same as taking care of your home or teeth.